An approach to global trends in March has to take into account the last US Federal Reserve meeting. Janet Yellen began her term making some changes from Bernanke’s heritage. She prefers to look more the job statistics before an increase in the interest rates. This announcement moved the market, mainly in the US. Our chart shows that 40% stocks have a bullish trend in the US, against the 36% in February. The chart below is clearer: the trend in the biggest world economy is more positive. The prices were low in February and that point attracted investors, together with the Fed outlook. 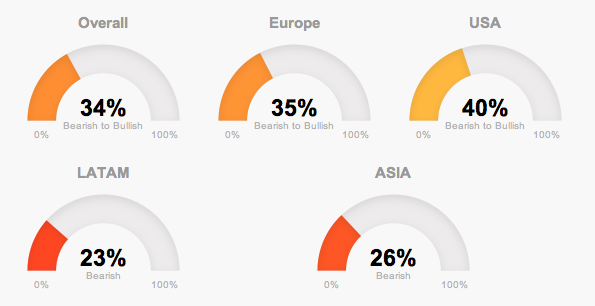 On the other side, emerging markets are still quite bearish. In LatAm the trend seems to improve, but the original point was so low that it will take still some time till the positions show a higher point. However, the line up appears to be solid, as it accounts a 23% against a 13% in February. But the more interesting development took place in Asia. Although the general trend in the continent is bearish, there is a jump in two countries to the top bullish positions: India and Indonesia. The reason lays on the elections. Both countries have elections in the beginning of April and the perspective is that new governments will be more “business-friendly” as their predecessors. The Indian and Indonesian stocks exchanges experienced in the last week a soar: more than 50% of the companies have a bullish trend. This situation in Asia is an exception, because the other main Asian stocks are in the lowest positions: China has less than 10% bullish; Hong Kong and Japan, less than 20%; and Singapore, less that 30%. Generally, stocks have chances to increase in the next months, as the beginning point is very low. Experts comment that April is a typical bullish month. Let’s see what we discover in four weeks. This entry was posted in Our Charts and tagged Asia, Latam, US, Yellen on April 8, 2014 by Oscar Garcia.